By the year 2000, it was obvious that the range of events that Conradh na Gaeilge was organising were so vast that there was a need for a more formal structure than the voluntary committee that was there until then. It was harder to keep going with current projects. It was decided that a central office would be established and a Development Officer be employed. A submission was prepared for FÁS and Foras na Gaeilge to start an employment project. Arrangements were made that the project would be registered as a limited company under guarantee without a shareholding in December 2002. As it happened, Foras na Gaeilge was preparing a scheme to employ people at a community level to promote the Irish Lanaguge. Ennis got the go ahead to employ two people and to rent an office under Scéim Phobail na Gaielge that was launched in 2003. 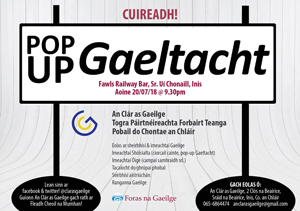 To encourage the Irish speaking community in Clare to speak the language. 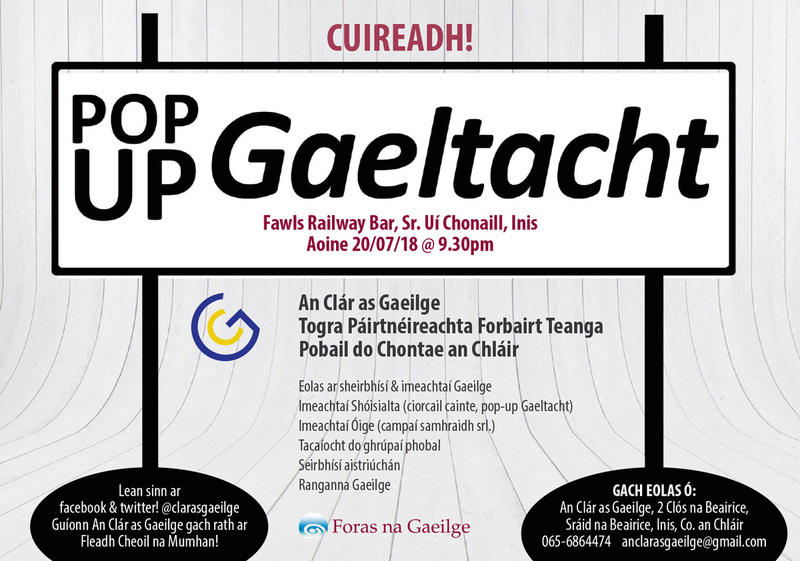 To foster a love for the Irish Language amongst young people. To strengthen the visibility of Irish in the county. To start a partnership with state bodies, the church and the people to provide for the needs of the Irish speaking community. To support cultural tourism in the County. Documents were prepared with six strategic objectives and submitted to Foras na Gaeilge and the submission was accepted as a pilot scheme for county clare. The project is financed by Foras na Gaeilge. Foras na Gaeilage has sanctioned three schemes for An Clár as Gaeilge Teo. under Scéim Phobail Gaaeilge from 2003 onwards. The committee has prepared an Action Plan for every scheme under the above mentioned headings.